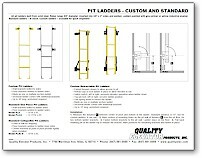 All pit ladders built from solid steel. Rebar rungs 5/8 diameter, inserted into 3/8" x 2" sides and welded. See worksheet/quote form drawing. Ladders painted with gray primer or yellow industrial enamel. 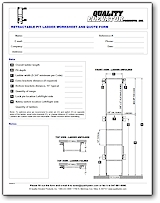 Standard ladders  in stock. 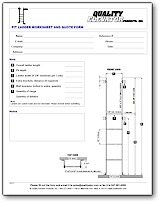 Custom ladders  available for quick shipment! Adobe Reader XI (v.11) or newer recommended. 1. 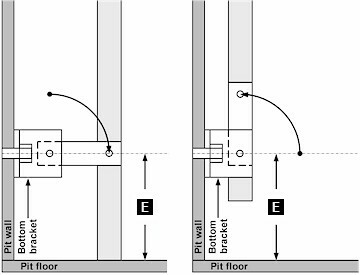 Measure the distance E between center of pivot and bottom of the ladder. Standard distance is 16", but for custom ladders, it can vary. 2. Mark centers of mounting holes on the pit wall at distance E from the pit floor, for two bottom ladder brackets. 3. Fasten bottom brackets to the pit wall. Ladder stays on the floor. 4. Pull back retaining pin at the ladder top to release the bracket. Mark positions for remaining brackets and fasten in place.